Blog | MedOutreach | Give Love. Bring Hope. See Change. The 2015 Team is Here! 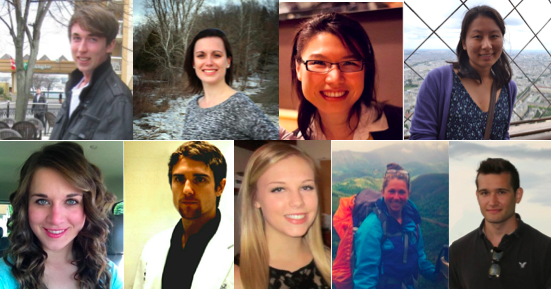 The 2015 MedOutreach team has been selected! Check out the “About” section to see profiles and photos of all our lovely new members. The past couple months have been a whirlwind of amazing experiences and adventures. We have all learned so much that we will be able to contribute to both our professional and personal lives. We have visited places and met people that we will remember forever. It’s hard to believe that tomorrow, we will be packing up our belongings and heading our separate ways. I know that we will be taking a piece of Tanzania home with each of us. During our time here, we have come to understand the value of being present, and showing care to others. I have realized the importance of simplifying life and embracing diversity, and have learned not to miss out on opportunities to form meaningful relationships, for fear of saying goodbye. We are looking forward to sharing our stories and experiences with everyone back home. We are so thankful for all those who have supported us through this journey. We could not have done this without you. We really appreciate the love and encouragement that we have received. THANK YOU! Last week, the MedOutreach team ended two (very hectic) weeks of health screenings. First was a day at the Nkoaranga Orphanage, where the med and nursing students worked with twenty-six children, all under the age of five. Vital signs were taken, physical exams were conducted, and developmental histories were taken from the childrens’ caregivers. The children started out very cooperative and friendly, but as the screenings dragged on into Nap Time, resistance increased and the team members had to tap inner reserves of patience and resilience to tears. Next came several days of screenings at the Sunrise of Life orphanage in Maji Ya Chai, one of MedOutreach’s oldest partners in Tanzania. The kids at Sunrise of Life are older than the kids at Nkoaranga, and most have spent time living on the streets of Arusha. 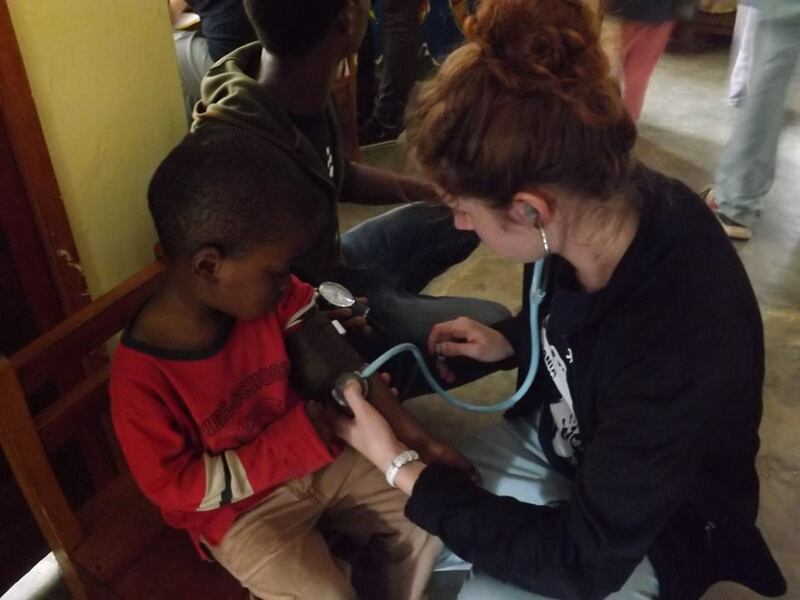 MedOutreach’s connections with Sunrise of Life are so old that children who were first screened by MedOutreach are now adults who work beside it (like Godlove, the translator working behind Chloe in the image below). There has been a significant turn-over of children at Sunrise in the last few years, and many of the new arrivals have no previous documentation, and no recollection of ever receiving medical care. The MedOutreach screenings represent the first entry in these childrens’ health records. Here, several significant health issues were identified, and MedOutreach has been working with the staff of the orphanage in providing follow-up care. The dental students did their own screenings here, as well, and gave free dental care to the kids who needed it at the Seventh-Day Adventist Dental Clinic in Njiro. 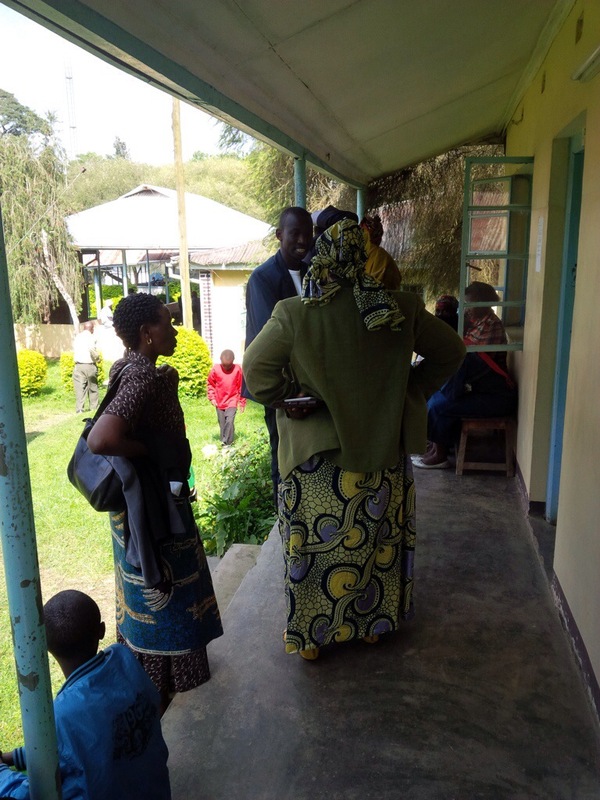 Finally, the team spent several days screening the Upendo CTC group in Arusha, a group of HIV-positive individuals whose care has been sponsored by the MedOutreach team for some time. It was a significant learning experience for the entire team in different ways. Even with modern anti-retroviral therapy for HIV, the health of affected individuals can be quite fragile, and there are many diseases, especially of the skin (seen by meds and nurses), and mouth (seen by dents) that are prevalent in this group that are almost unknown in the general population. Being able to take histories from adults in Tanzania also provided some opportunities for eye-opening about the cultural differences between Canada and Tanzania. …and participated in a surgery where the electricity went off four times. The surgeon looked up from the dark sterile field and said “this is the way we do things in Africa… when something does not work, we search for something else.” And so we found a flashlight and the operation continued because being innovative goes a long way, and when you don’t have everything you need you find out you don’t need it as much as you once thought you did. Today I heard laughter, the splashing of water, and the yelping of another swimmer flying from the rope swing. I sat in the dala dala with the conductor hanging out the window and listened to him bang on the metal door wherever a potential passenger waited for a ride. We jolted over the dirt roads till our stomachs started to turn and our mouths became dry from the dust flying through the open windows. Teasing head on collisions we weaved through traffic, and there was more than one moment when I thought it was going to be the end. Today I set my camera down and watched the shops and houses go by out the window, smilling at the bright red Airtel signs at every convenient store. Small cement buildings, some of which are no bigger than my bedroom at home, house whole families. I looked at the brightly coloured clothing hanging on the clotheslines and the washbasins, stools and dishes sitting outside. I saw the people smile and wave and watched a child pull around the only toy he had – a plastic bottle on wheels. Today I smelled the familiar smell of rice and beans coming from the kitchen. I savored the sweet, milky chai tea that I once hated and though about how I have come to look forward to chips mai yai, eating off chicken bones, and the routine boiled egg every morning. The kids ate their rice and beans with their hands so I gave back my spoon and joined them. Today I set my camera down to play kuku kuku simba, Dr. Pretzel, and checkers with bottle caps. I fished in water holes for soccer balls, was chased by boys with large bugs, and line danced in the dining room. I sat down on the bench and laughed when two of the youngest sat beside me and copied the way I crossed my legs and folded my arms. When it was late they moved close and rested their heads on my lap till their eyes started to close in a deep sleep. Today I washed dishes with a dear friend. As we stood outside by the chickens waiting for water to fill the buckets I talked about my family and she told me about hers. I listened to the heartbreaking tale of how she ran from her abusive father with her mother and sister when she was just four. They stayed with their grandfather, but his friends beat her mother again and again. She was always hungry. They were never safe. She told me how her grandfather had held a knife up to her mother’s throat. She shuddered, but I was the one who cried. As I listened to her explain how God is helping her to forgive I reflected on my blessed life in Canada and wrestled with the many ‘why’ questions flooding my thoughts. Every time I hear stories of abuse and abandonment, see families collecting water from a stream surrounded by garbage, or hold the hands of children who just want to be loved, my heart aches a little more for both the evident need here and the better-hidden need at home. Today I set my camera down, because the best things in life aren’t documented, they are experienced. Pictures simply cannot do justice to what I saw, heard, and did in the moment – and how it changed me. We apologize for the delay in posting this update but we have been busy in Maji Ya Chai this week and have not had internet access. We are very excited to share with you that after spending two weeks at Nkoaranga Lutheran Hospital, MedOutreach decided to put forth the funding to pay for two patients’ hospital bills at Nkoaranga Lutheran Hospital on July 22nd. Both of these patients are people that various members of our team had been working with over the two weeks we were at Nkoaranga, and had the opportunity to listen to their stories about how they came to be in the hospital through our wonderful translator and friend, Godlove. Please note that we were given permission by all parties to share stories and photos of the individuals. John is forty-nine and has been in the hospital for the last eleven months. Previous to his time in the hospital, John did physical labour for a living. He is a bachelor and was privately employed at the time of his accident. One afternoon when he was taking his boss’ car to get washed, his car collided with a dala dala and was totalled. Based on the details from the accident, it sounds like John is lucky to be alive. He had to have a series of surgeries, one of which was an above-the-knee amputation of his leg. John suffers from retrograde amnesia and does not remember a lot of what happened before April but was filled in on a lot of information by his neighbours who came to visit. John was unable to pay his extensive medical bill and was forced to stay in the hospital because of that. When he is discharged from the hospital, John plans to have his own fruit and vegetable stand. Mwindini is a fourteen year old boy from the paediatric floor of the hospital. He came from a remote village outside of Arusha, part of a family of six – mom, dad, and four kids. Mwindini’s father was a security guard but only a month after Mwindini was born, his father was shot and killed while on duty. Then, due to their inability to access health care where they live, his three older siblings all died of various illnesses when they were young, leaving Mwindini and his mother alone. Already, in his early childhood, he had experienced more tragedy than most people will face in a lifetime. Unfortunately, that is the reality for many children here. When other health related issues arose, Mwindini’s mother was forced to leave their close knit community in search of work to help pay for medical bills. While they were living away from home, Mwindini was sent on an errand and while crossing the street he was struck by a piki piki (motorcycle). Mwindini and his mother traveled frantically from one hospital to the next searching for someone who could help repair his leg. Eventually they were admitted to Nkoaranga Lutheran Hospital. As we noted in his admission documents and on his x-ray, the impact from the collision had snapped his tibia and fibula and they were now protruding from his leg. The surgery to repair his leg took place in the beginning of April but because they were unable to pay the entirety of the unplanned hospital bill, they were required to stay in the hospital until it was fully paid. A lot of hospitals here are much different than in Canada because the family is responsible for their loved one’s personal care like changing them, bathing, and providing them with food. Because Mwindini’s mother was expected to provide all of this care, she was unable to work to make money to pay for the hospital bill. As time went on, the bill kept increasing because they were still required to pay for accommodations while in hospital. When a family or individual is in this type of situation, it is nearly impossible for them to get out and they can rack up millions of shillings in debt. Near the end of the two weeks at Nkoaranga, Mwindini’s mother approached one of our team mates asking for a contribution to help pay the hospital back. Most of the pledges listed were somewhere between 500-1500 shillings (30-90 cents), which is less than what most Canadians have in their couches. After talking it over with the team and learning more about the family’s past struggles and their current situation, we decided as a team that paying the remainder of the family’s bill would be a wonderful way to help a family in need. Mwindini and his mom were overjoyed to hear that they would finally be going home and there were lots of hugs and kisses to go around. We would like to take this opportunity to thank all of our donors for their contributions to our fundraising efforts. It is because of your generosity that we are able to provide relief for some people here. We would also like to thank Corunna United Church for the beautiful prayer shawl that they made to be a symbol of encouragement and blessings. We were instructed to leave the prayer shawl with a family or individual in need so we decided it was most appropriate to give it to Mwindini and his mother, who were touched that people in Canada had them in their prayers. We have nothing but thanks to the people back home who are consistently supporting our team. Stay tuned for more updates! Already week 4! We just finished up with our 2nd free dental community clinic at Nkoaranga Hospital last week! (It ran on Wednesday and Thursday) We had so many people coming in to see us to receive urgent dental care which we were more than happy to provide. With the help of the hospital secretary – Jeremiah – Jeremy, Tara and I had sent out a letter regarding the free camps to approximately 50 different churches and communities well in advance to inform them of the dates and the clinic where we would render treatment. It was probably the soaring success of the 1st camp the week before that word got out and we had close to a 100 people from all adjoining villages come see us over the 2 free-clinic days. Unfortunately, on both days we did not have electricity during the morning half and had to strain our necks and backs and work under the luminescence of our headlamps. That also meant that the turnover time for getting back our instruments back from the sterilizer/oven would be prolonged. We did manage to complete a few difficult extractions in less-than-ideal illumination , but we got the job done. Jeremy did a fantastic job sifting and triaging patients and redirecting traffic with the help of Godlove(our very charismatic translator) for Tara and I, based on whether they may need a ‘surgical’ procedure or not as I was manning the only dental chair which had the necessary instruments and drills attached. Tara took on extractions and ART (Atraumatic restorative technique -ie fillings) in Dr. Frank’s waiting room like a veteran. I don’t know how she managed to treat so many patients on a simple wooden chair but I’m sure her neck/back needed some tlc after such a long rewarding day. Christine, Shannon and Chloe took turns helping us out – getting our instruments cleaned and ready, setting up our work stations, giving moral support to our patients, which was such a big help. I don’t think we would have run our clinic as well and as smoothly as it did if it wasn’t for their contributions. If nursing doesn’t work out for them, they will make dynamite dental assistants. Travis and Shaylan even popped in to lend a hand when they weren’t busy with medical rounds or sorting out details for later visits at local orphanages. After a well worth but tiring 2 days, a 103 very grateful patients and 3 groaning stomachs, we clocked in close to 20 hours of really rewarding work. I couldn’t be happier with our stint at Nkoaranga and the rewards which came along with it. Jeremy getting assistance from Travis in the “waiting room” before he threw out his back and became the head of triage. New Adventures in Conjugating Swahili Verbs. East Africa is one of, if not the most, polyglot regions in the world. There more than 100 languages still in use in Tanzania alone, and unlike traditional languages in many parts of the world these languages are still used every day in homes. Most Tanzanians learn to speak one of these languages before they learn Swahili. Swahili is the common language of East Africa, and the official “cultural language” of Tanzania (English is the official “technical language”). As a common tongue meant to be spoken by all it is, thankfully, surprisingly easy to learn. Any anglo-Canadian who has tried to memorize conjugation schemes for dozens of French verbs will appreciate the shockingly straightforward scheme for conjugating Swahili verbs. Conjugation is how a language includes information about who is performing an action and when it is being performed. In English, we say “I HAVE fun,” and “you HAVE fun,” but “she HAS fun.” That’s conjugation. Each verb in Swahili is conjugated by adding two prefixes: one which indicates who is performing the action, and one which indicates when it is being performed. The first prefix indicates the “who.” The ‘ni-‘ prefix indicates that “I” am performing the action. “U” (pronouced like the “ooooh” you make when you see fireworks) indicates “you,” and “a” indicates “he or she.” The second prefix indicates “when.” “Na” is “now.” “Ni” is the past, and “Ta” is the future. Just for fun, we have added a few pictures from one of our many Dala Dala rides. 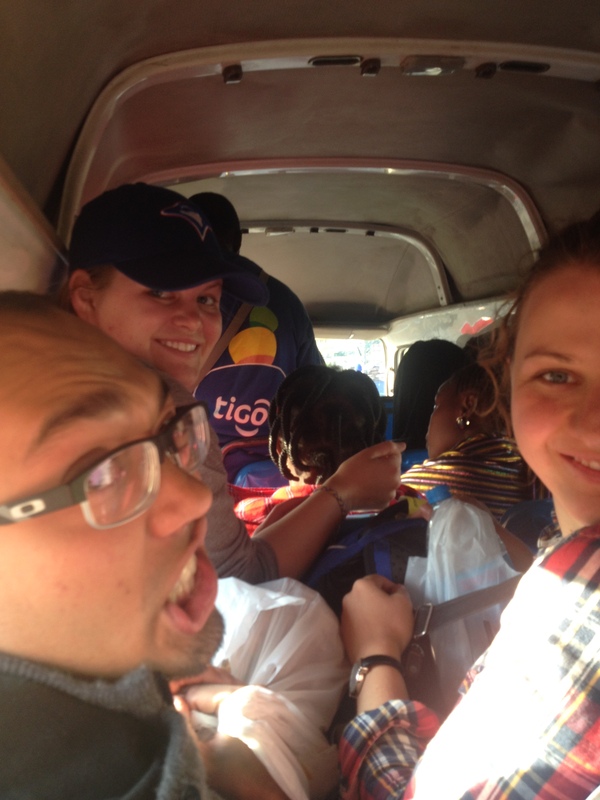 This particular time there were 29 people squished into that van… there is no such thing as no room in this country! We have had a great first week at Nkoaranga! Nkoaranga is in a significantly more rural area than Arusha, and we have been enjoying the change of scenery. The team has been staying in a large, old house (above) on the hospital property. 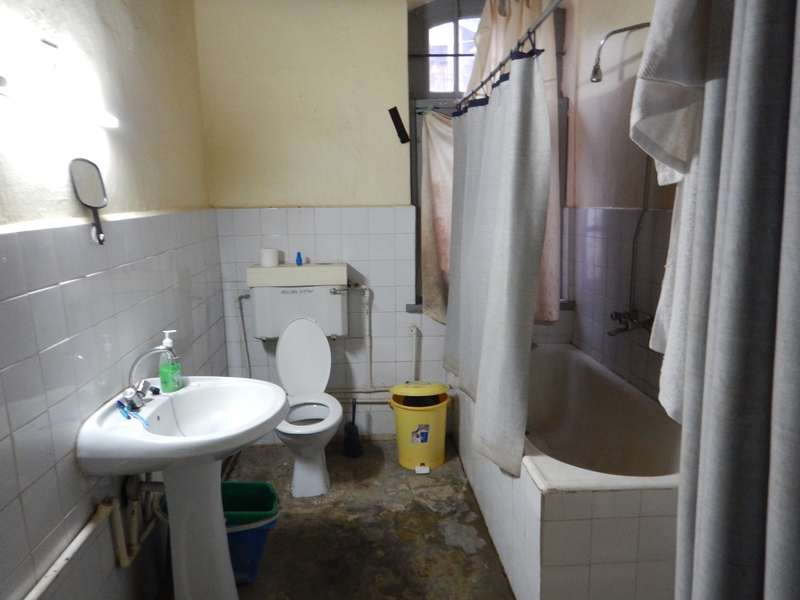 Even though the house itself is spacious, the eight of us + Godlove share a washroom (pictured below) which has taken some getting used to. Between sharing a washroom and bunking in two adjoining rooms, our personal space bubbles have gotten a lot smaller! Being so close to the hospital is extremely convenient for us and increases our ability to be involved in what is going on. For example, we are able to be ‘on-call’ for busy times in the Obstetrics unit and are called in when the residents are going into labor. Our house is also quite close to the Nkoaranga orphanage and in our spare time we have been able to play with the kids there as well as meet other volunteers. 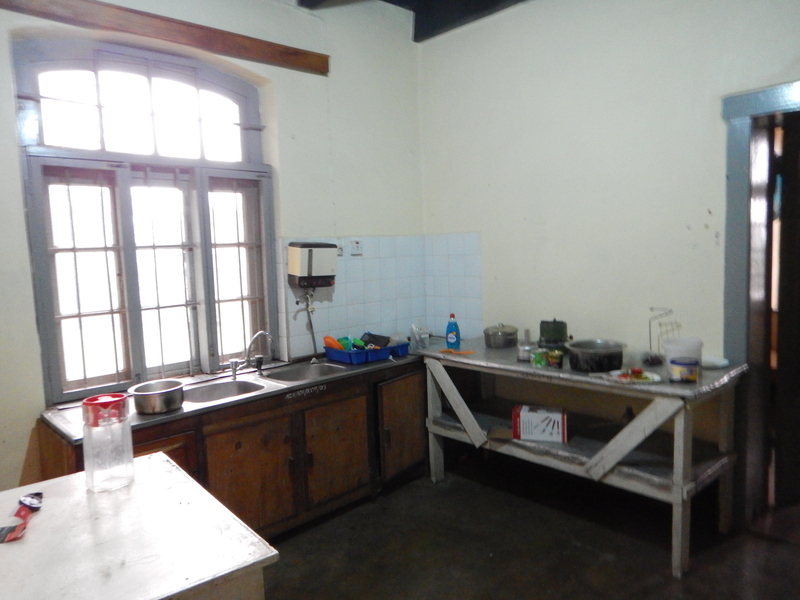 At first we were very wary of using the kitchen (above), but after we managed to get the stove working, our excitement about being able to cook for ourselves took over. So far we have been able to make omlettes, egg in a hole, and vegetable stew, and we plan to try making more meals this coming week. The nurses and meds have had some great opportunities to work in the hospital here, including assisting with c-sections and other surgical procedures, dressing wounds, helping the dents during their free clinic, and working along side the nurses/doctors during their daily rounds. One of the most difficult things that I have found with the hospital is the slow pace at which things move. “Pole, pole” (slowly, slowly) as they say in Swahili. This aspect of the Tanzanian culture has been difficult for me to adjust to because I am used to the much faster-paced Canadian society. In as much as we have had many valuable clinical opportunities, there are also moments when I have felt my contributions are restricted because of the slower pace. We are learning to maximize our effectiveness within our limitations by looking for additional ways that we can serve. Dents Successfully Run Our First Free Clinic!! This past week the whole team moved up to Nkoaranga Hospital. 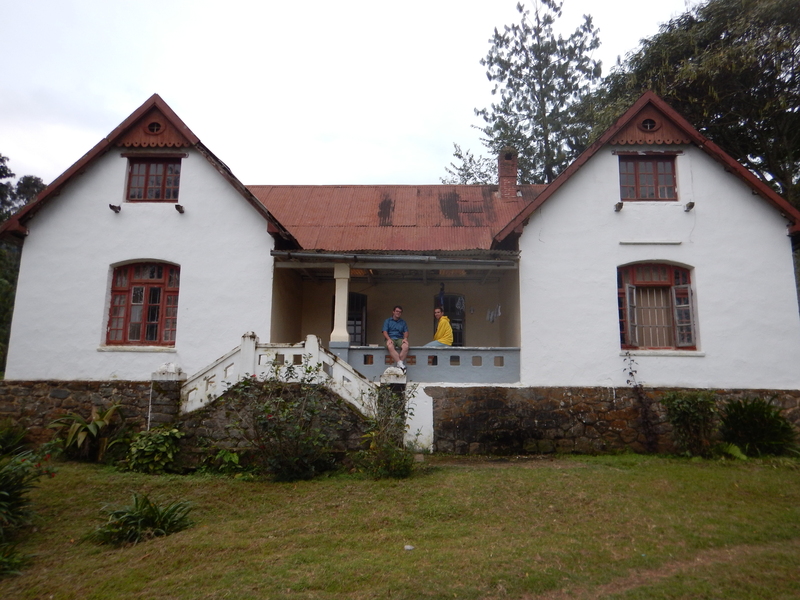 It’s a small hospital slightly up in the mountains about an hour outside Arusha, at the base of Mount Meru! Being Tanzania’s 2nd highest mountain, our views and surroundings are incredible! There was a national holiday in Tanzania this Monday so our team took advantage of this long weekend and head out for a great 3 day Safari Adventure! We spent the first say in Tarengire, our second day at Ngorongoro Crater, and our final day at Lake Mayara park! We were up close with tons of wild animals! Lots of excitement for all of us! Zebras, wildebeests, buffalo, lions, giraffes, hippos, warthogs, meerkats (so Timone and Pumba! ), ostrich, impalas, gazelles, storks, flamingos, pelicans and many other colourful birds! 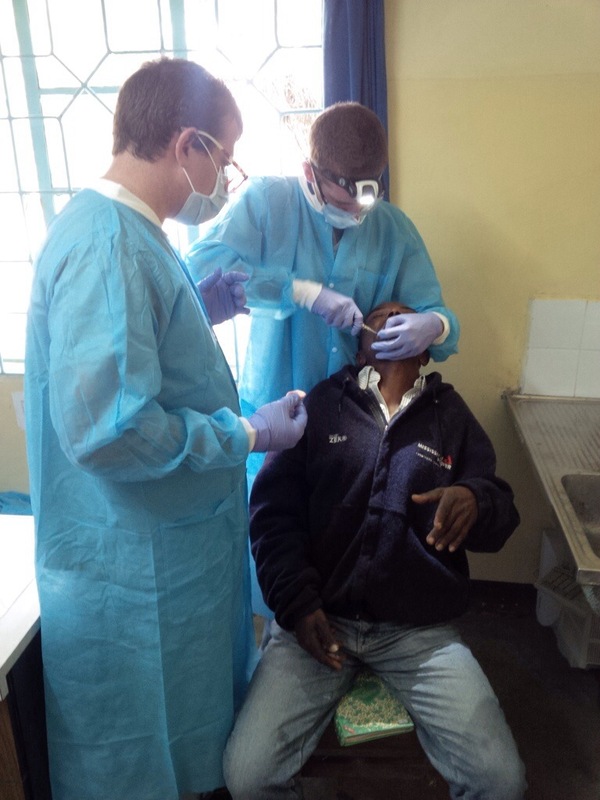 We spent the first two days of this week working in Dr. Frank Akyoo’s dental clinic at the Nkoaranga hospital. These days were a bit slower than our upcoming free community clinic days, but still an more exciting than our usual two patients a day back at school. The first day we treated five patients, and then eleven the second. Eleven patients in one day was BUSY for our standards, we barely had time for much of a break at all. 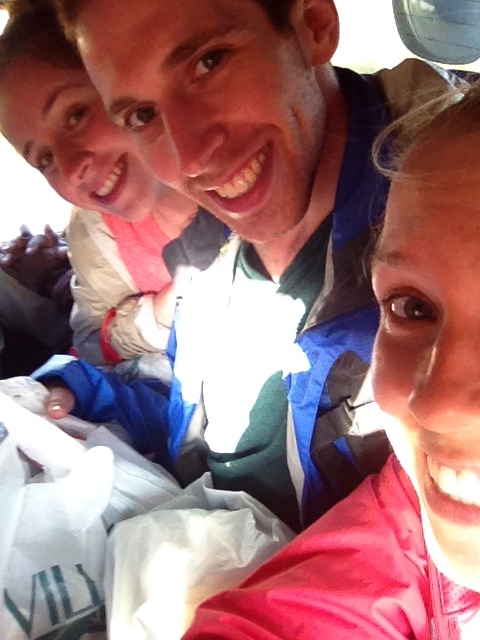 The swahili-english language barrier was a real road block for us and slowed our pace down. The final two days of this week, Thursday and Friday, were our free community clinic days! Without a doubt, these were our most rewarding days yet!! We really had a huge impact here and helped the lives over 70 patients…in two days!! Way busier than we’re used to back home! Day one we saw 39 patients, with clinic running from 9:00-4:00! We were lucky to attend to and treat all patients who showed up by 4:00 and didn’t have too late of a day. Day two we saw 33 patients and ran it from 9:00 until about 4:30. Both very successful days!! Treatment is different here than we are used to in Canada. We are limited by the clinic we work in, and the resources we have available, but are learning quickly how to work with these differences. Our treatment is fairly limited to fillings, scaling/cleanings, and extractions. Most of our treatment so far has been extractions simply because most patients here wait for their decaying or problematic teeth to progress to the point where they are not savable, (or at least not salvageable with Tanzania’s limited resources). We are unable to perform root canal treatment here due to lack of appropriate instruments, supplies and resources; so once the dental pain reaches an irreversible stage, the only treatment we can offer here to relieve the pain is extraction. It’s really nice this year to have three dental students compared to the usual two. During the free clinic days, we run two “ops”, one in the main dental chair (picture posted is past post), and the second “op”, just in the front room – while we’re working it consists of only a standard house chair, and sink. We wear headlamps for lighting, and some slightly awkward, non-ideal acrobatic positioning to work efficiently. The third dental student will either be assisting another, sterilizing instruments, or taking down names outside and pre-screening for a potential early diagnosis. I had the chance to take a short 5-10 minute break out in front of the clinic on day one of the free clinic to grab a quick bite…we need to stay energized after all… That moment to stop and see what we were really doing that day, and the impact it had was INCREDIBLE! As I stood out front there were over 20 patients and others accompanying them sitting or lying on the grass just waiting to be seen. They all seemed to be looking up at me in my scrubs with eyes of pure appreciation. Many had walked from miles away, some taking two hours just to get to our clinic. I could feel the good we were doing! This was the moment I felt it, this is what MedOutreach is really all about! We are making a difference! We are helping those in need! What an overwhelming, awesome feeling! I’m sure the weeks to come will bring much more! For the near future, the MedOutreach team will be going to Nkoaranga hospital, in the countryside. Because we can’t be sure of having Internet connectivity there, blog updates might be infrequent for the next few weeks. 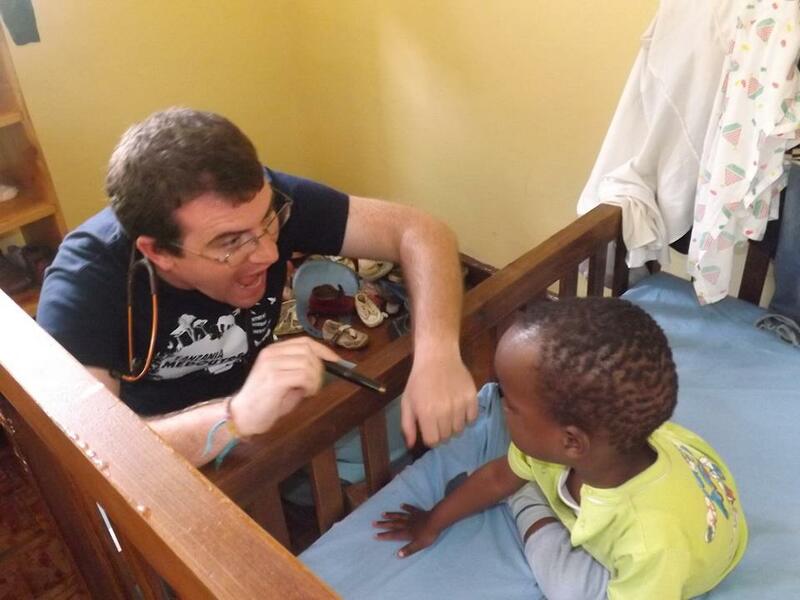 The medical students have been working in Arusha for three weeks, now, with our local contact Dr. Mhando, at several local clinics and a hospital. The interview and physical exam are at the heart of the practice of medicine, and that heart beats very differently in Tanzania. General practitioners can take up to an hour interviewing and examining a single patient, a length of time unheard of in Canada. Because lab tests and imaging are less available, diagnoses often hinge on a crucial finding in the physical exam. This is an excellent environment for med students to work on their own physical exam skills. We have a chance here to take our time with each patient, under the tutelage of doctors who have perfected the skills of palpation, percussion, and auscultation. Many of the patients in the clinics are local Maasai. They are a very tightly-knit community. “Treat one Maasai,” Doctor Mhando told us, “And five more will come.” The Maasai have maintained many aspects of their traditional lifestyle, and many local Maasai still live very closely with their herd animals. One consequence of this is frequent cases of brucellosis, a very rare diagnosis in Canada usually associated with unpasteurized milk. Brucellosis typically presents with unexplained fever and muscle pains, and in Tanzania it is important to distinguish it from malaria and typhoid fever. However, most of the Maasai we see in clinic are basically as healthy as the other patients, and always very friendly and open. We had the unique opportunity to take a history and conduct a physical exam on a quite healthy 100-year-old Maasai woman recently.